Where is Hot in October? Toffee apples. Crunching through piles of pretty russet leaves. Rediscovering our winter wardrobes. These are just three autumnal perks we absolutely love. Even so, there’s no substitute for summer and we can’t help but look back wistfully at our bronze-tinged memories of July and August as the mercury continues to fall. If you can’t stand the heat, get out of the kitchen, they say. And if you can’t stand the cold? Get out of the country and get your tan on this October with a last-minute holiday. Whether you’re after a short-haul budget break or a more exotic getaway where the sun is nothing short of sizzling, there are plenty of destinations to take your fancy. You just have to know how hot you want it and how far you’ll fly to find it. 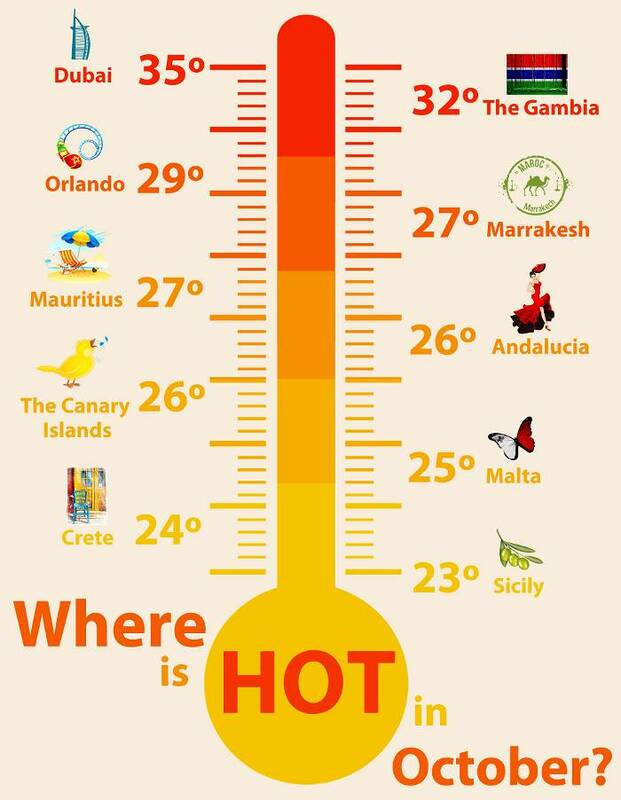 So we’ve rustled up this handy thermometer of our top 10 hot destinations for October, complete with flight times from the UK below. Happy travels! 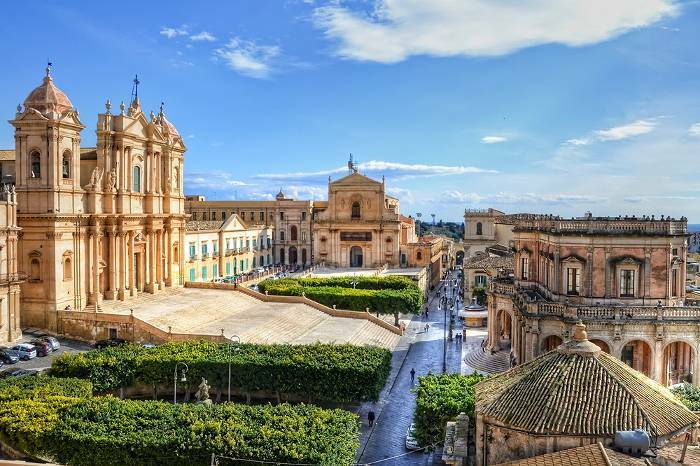 Swarms of visitors descend on Sicily in summer to take advantage of high-twenties heat, but October can be a much more pleasant time. It’s far less crowded and still boasts warm weather and nine hours of sunshine a day. Swimming in the Med in autumn might be a little too bracing for our liking but the stunning sight of red and orange vines before a snow-capped Mount Etna more than makes up for it. It’s also grape, olive oil and nut harvest season and the best time to sample local products. 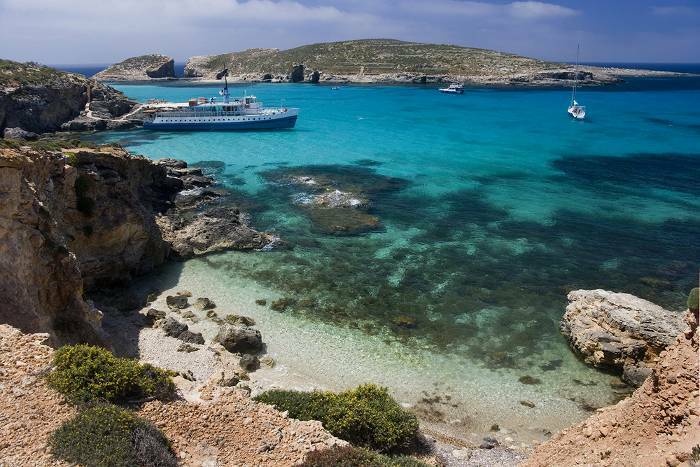 If you’re seeking warm and sunny climes but don’t want to stray too far from Blighty, Malta is one of your best options. It’s just a three-hour flight from home yet thanks to its location as one of the most southerly points in Europe, the weather should be about as balmy as you can get on the continent. You’ll find a great range of holiday accommodation in the beach resorts of Sliema, St Julian’s and St Paul’s Bay. Make sure to take a day trip to the walled city of Valletta, a UNESCO World Heritage Site. Much of Western Europe starts to cool down in October and Spain is no different. Yet in Andalucia, the most southerly Spanish region, you can still catch temperatures in the mid-twenties. 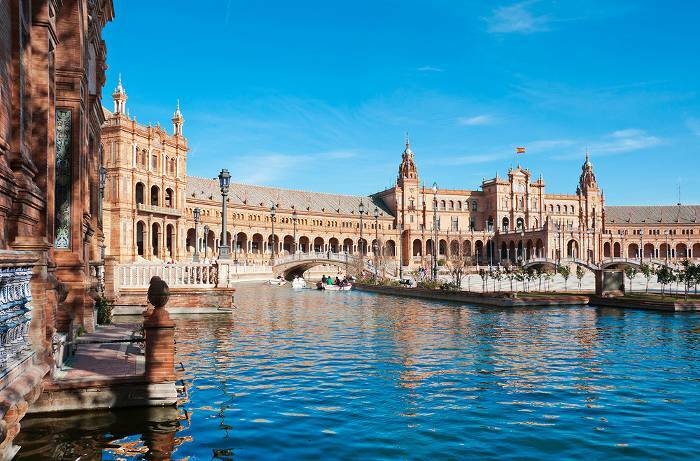 The Costa del Sol will likely be a few degrees cooler than cities like Seville and Granada, but still pleasantly warm and as a bonus, you won’t be hard-pushed to find a space on the beach to lay your towel. An Andalucia break is also likely to be easiest on your pocket, with cheap flights to Malaga operating from most UK airports. While we do love a good beach holiday, we’re also always on the lookout for the best city break spots and our number one pick for October is Marrakesh. 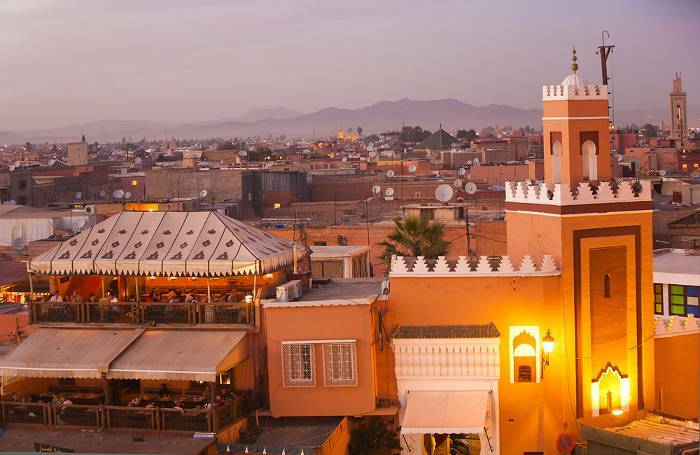 Rising up from the Moroccan desert and flanked by the looming Atlas mountains, this vibrant city is jam-packed with stunning architecture, bustling souks and elaborate boutique hotels. And that’s not to mention local delicacies like lamb tagine and cous cous. All of which you can enjoy while basking in 27° sunshine – sounds like a plan to us. 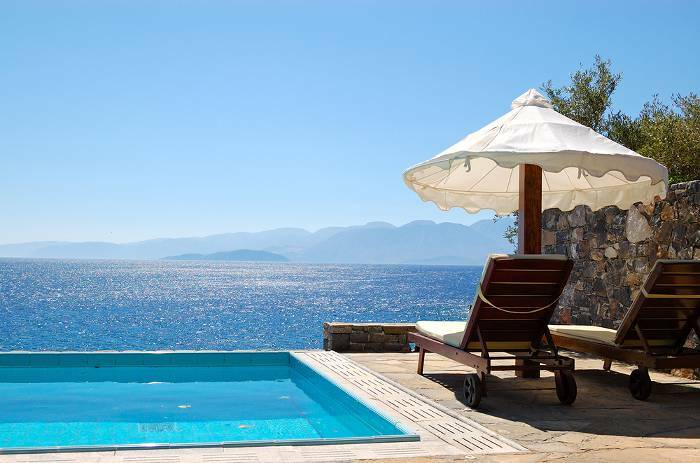 Crete is the most southerly of the Greek islands with an enviable climate; 320 days of sunshine per year and temperatures around 25° well into October are just two of the highlights. Some of our favourite areas include family-friendly Hersonissos with its long sandy beaches and Roman ruins, the historic Old Town of Rethymnon and glamorous Platanes with its plethora of cocktail bars. Those looking to party hard in Malia should note that the nightlife is much more sedate at this time of year. With warm weather and plenty of sunshine year-round, the Canary Islands are popular at the best of times. Yet October gets our vote for a Canarian getaway thanks to the winning combo of fab weather and lack of crowds. 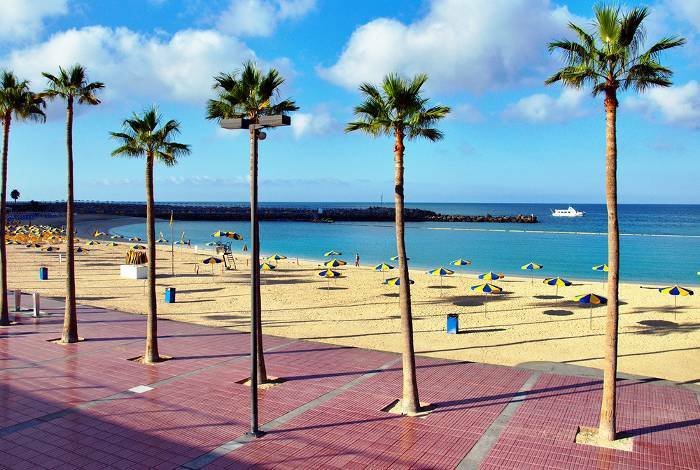 Each island makes its own distinct mark, from the secluded bays and abundance of watersports on offer in Fuerteventura to the stunning Maspalomas sand dunes and the historic city of Las Palmas in Gran Canaria. With so much choice, you’re bound to find the Canaries holiday to suit you. 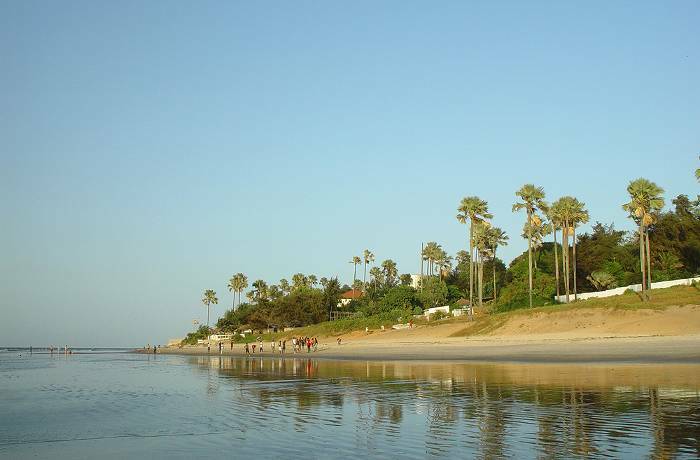 We’re amazed more people don’t plump for the Gambia for a sunshine holiday as this West African country ticks all the boxes in our book. In October it’s very hot and sunny with average highs of 32°, it’s just a six-hour hop from the UK and offers some of the most picturesque tropical beaches around. Plus, it’s an English-speaking country with a wide range of tourist accommodation and locals renowned for their friendliness. Highlights for your itinerary include Sanyang Beach and the Abuko Nature Reserve. 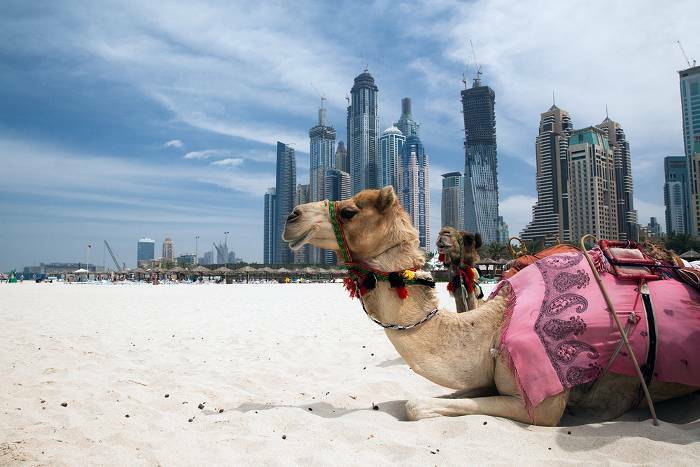 If you’re adamant that nothing but scorchio will do for your October getaway, visit the opulent desert city of Dubai. While temperatures regularly tip a sweltering 40° in July and August, they drop down to a more bearable but still baking 35° in October, making autumn a popular time to visit. Just don’t forget your factor 50. And if you need a bit of respite from the beach when the sun’s at its hottest, retire to the covered gold and spice souks or the gigantic Mall of the Emirates for some cool retail therapy. With highs of just under 30° and low humidity throughout Florida in October, the entire Sunshine State is a pretty safe bet for an autumnal escape. 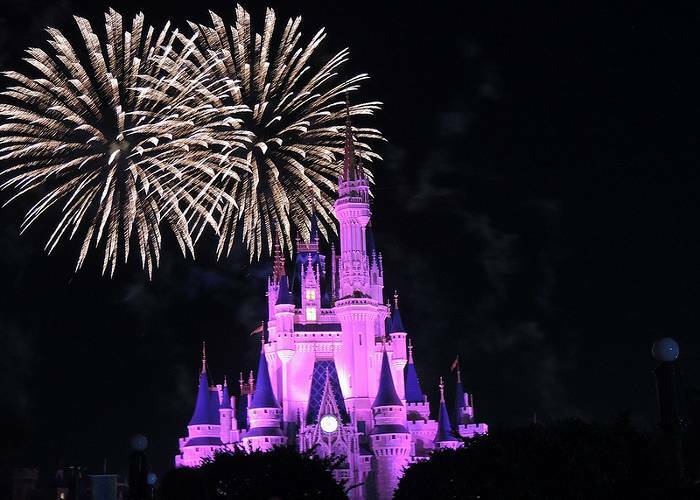 But Orlando offers an additional bonus; much-reduced theme park crowds compared to summer, even if you’re visiting in half-term, as well as cheaper flight and hotel rates to boot. There are plenty of seasonal celebrations happening too; don’t miss Mickey’s Not-So-Scary Halloween Party at Magic Kingdom® and Halloween Horror Nights® at Universal Orlando®. 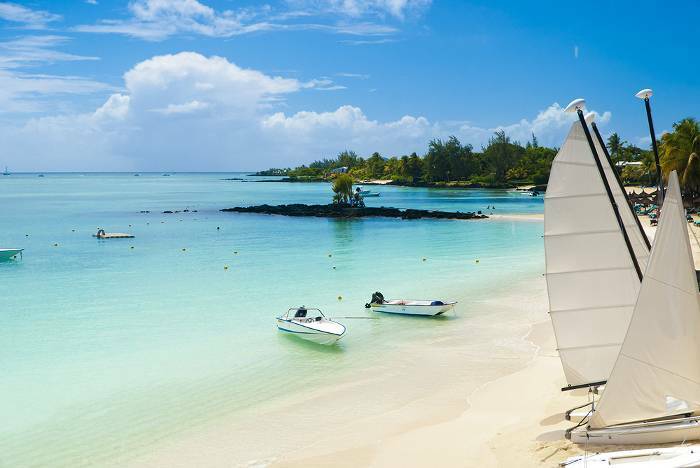 With a flight time of 12 hours from the UK, Mauritius is most far-flung destination on our list. But when you see the white sandy beaches and crystal aquamarine waters waiting for you at the other end, we think you’ll agree it’s well worth spending a day on a plane. October is one of the best times to visit too, with balmy temperatures of around 27° and eight hours of sunshine per day, while avoiding the rainfall and cyclones from January to March. If it’s a tropical paradise you’re after, you couldn’t do much better. Note: Flight times are based on flights departing from London airports. If you plan to fly from elsewhere in the UK, you may need to add on a little extra time. ← Travel Myths Busted: The Top 5!